ResponsiveVoice Website Voice Agent is a system designed by ResponsiveVoice that enables text to speech features on a particular website. By adding Website Voice Agent to your website, you can engage visitors with voice messages and increase accessibility to your website and more. Adding Website Voice Agent to your website may be useful if you want to increase engagement and improve conversion rates, and provide wider accessibility to your content. Here are steps on how to add Website Voice Agent to your website. 1. 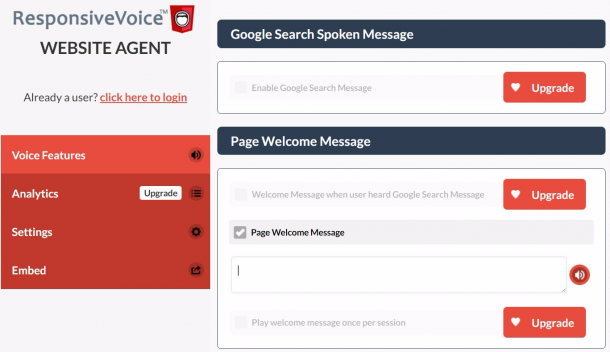 Visit https://responsivevoice.com/voiceagent/ to create your Website Voice Agent. 4. In the Embed Section click Create Page Code. Your unique voice tag will be displayed. The voice tag is a string of HTML code you will copy and paste on every page of your website you want to enable voice features for. 6. Add the voice code to your website. Copy the voice code and paste it into the HTML of your web page just before the closing body tag. 7. Verify your voice code works properly. To make sure Voice Agent is working on your website, visit the webpage you added the code to. Ensure your speakers are on. Depending on the voice features you enabled you will hear spoken text. This could be the welcome message, selecting text to hear it read, or accessibility features such as spoken links. Congratulations, you have successfully voice enabled your website! To edit your voice agent messages in the Free version you must create a new embed code and update your website. For editing capabilities and more signup for the full featured special $1 trial. If you have any trouble enabling voice on your site please contact support.